Hitler supported his Muslim Nazi co-hort, al Husseini, in his quest to make "Palestine" "Judenrein". 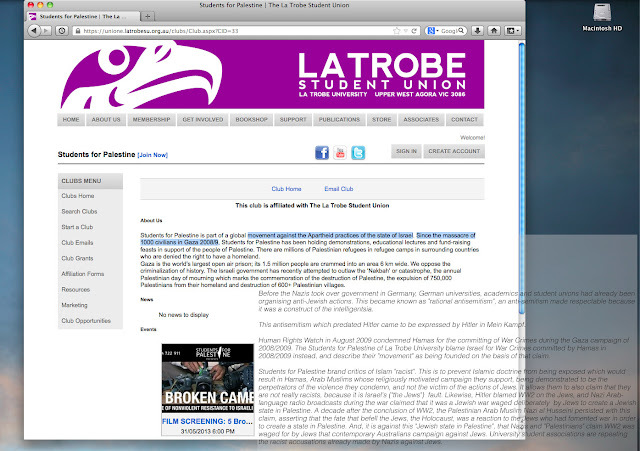 In Australia, university student union associations such as Students for Palestine are supporting the "Palestinian" quest to turn the Nazi dream into a reality. Students for Palestine support a cause that was dear to Adolf Hitler and to Nazis such as al Husseini. That cause is the plight of the "Palestinians" in solving their "Jewish problem"; a "problem" that predated the creation of Israel. The plight of the "Palestinians", who are defined as Arab by race and Muslim by religion, is the striving to accomplish in deed what is demanded by Islamic religious doctrine: the elimination of Jews. This doctrine predates the existence of Israel. According to the hadith, which were compiled 1,100 years ago, the "Palestinians's" plight is Islamic; and involves a necessary committing of genocide of the Jews. And on their complete genocide, humanity, Islam promises, will find that god raises the dead, and judges them for their deeds, which is something a little more than the Nazis ever promised. "Allah made a covenant with the Israelites ... But because they broke their covenant We laid on them Our curse ...They have perverted the words of the Scriptures...You will find them deceitful except for a few of them ... " Koran, The Table 5.11-17 Dawood translation. The so-called "Palestinians", who define themselves as Arab and Muslim claim a territory named after Mycenaean Greeks (Philistines) who settled there around 3000 years ago to be theirs to the exclusion of Jews and non-Muslims. However, the territory they lay claim to has to be made Judenfrei first, which is apparently not racist. 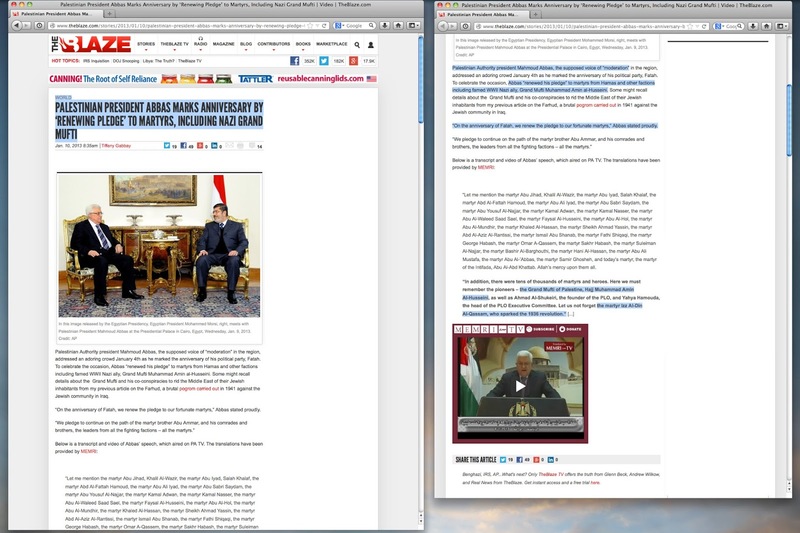 This is reflected in the Hamas Covenant and a recent (2011) PLO announcement. This cause was also one supported by Australia's current Mufti who on his visit to Gaza in late December 2012 proclaimed he would induce the trees and stones to speak, for the purpose of flushing out all the Jews. Charming. This is the cause supported by the Students for Palestine which they so desperately want to not be known. Such also was the solution sought for Europe, and the world by Adolf Hitler. "Palestinians", such as Hamas, proclaim genocide to be a central and mandatory component in their covenant, citing the genocide hadith (see below) in Article 7 of the Hamas Covenant that claims that even the rocks and trees behind which the final Jew might hide will call to the Muslim to tell them that a Jew hides behind them. One of the hadtih calling for the genocide of Jews as a necessary precursor for Islamic Judgement Day. Though genocide, and the incitement to commit genocide is a crime under International Law, university student bodies such as the Students for Palestine in Australia support "Palestinians", such as Hamas, in Hamas' endeavours to commit genocide of Jews. Ostensibly this is claimed to be really be support of protest against "Israel" - not Jews - and Students for Palestine insist that theirs is support is for a battle against "Zionism" which they equate with "racism". Because they so fervently shout down anyone who cites Islamic doctrine it is obvious to me that they are aware of Islamic scripture, but desire to hold onto their hatred of Jews. The argument that they present is that Zionism is the causal agent for conflict. This claim fails in a number of ways. It is based on the assertion that only one side can be responsible for this conflict, and that this side is Israel, and that this is the fault of Jews alone, which means only the Jews' ideology, Zionism, and the Old Testament which it is claimed is the basis for Zionism, can be investigated or criticised, not Islam. It is NOT a matter of accident that Genesis is the first book of the Torah (the Torah is the first 5 books of the OT). It is NOT a matter of happenstance that Hitler's racism is based on the books of the Old Testament (that constitute the Torah) to justify his racism. It is NOT a mater of serendipity, that if you intend your audience to blame Jews you would limit the debate to consider ONLY what they know, or believe they know, which is the Old Testament, as this will confirm their prejudices. And by condemning ANY reference or discussion of the actual basis for conflict, Islamic doctrine, the KORAN and HADITH, the Students for Palestine leave only the Jewish, Biblical, doctrinal elements available to be criticised because they only want one side, that of "the Jews", to be blamed. Unsurprisingly, only the Jews are found to be at fault by a process that allows only them to be blamed. However, the claims that Israel is Zionist, and that Zionism is based on Jewish religious doctrine that calls for racial purity, and that Israeli "Zionism" is therefore racist and excludes non-Jews is not supported by evidence. Israel includes as citizens and has in its parliament not only Jews, but Muslims and Christian Arabs. One in five Israelis is actually Arab. One can say that a SUBSTANTIAL MINORITY OF ISRAELIS ARE "PALESTINIAN". If "Zionism" was the policy pursued by Israel, and if the "Zionism" practiced was racist and exclusionary of all but Jews, there should be no Arab, Muslim citizen nor any other non-Jew in Israel's parliament. Indeed, the only "country" striving for a racially exclusionist nation is the "Palestinians" themselves, the very people whose cause is supported by the Students for Palestine. 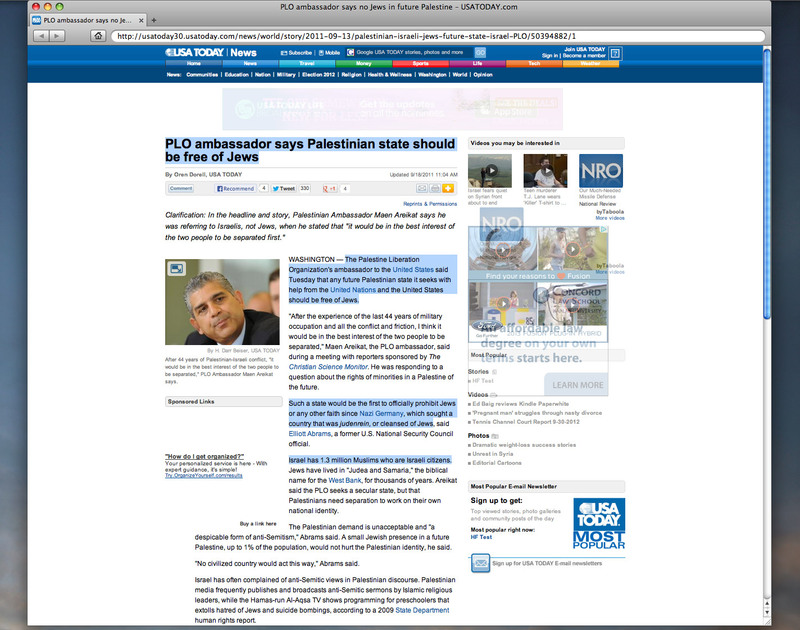 In 2011, the PLO ambassador called for “Palestine” to be Jew-free. It was noted that this was the first nation since Nazi Germany to openly proclaim that it was striving to achieve this end. The Students for Palestine, and other like-groups support a genocide that is demanded by Islam, but demand we remain ignorant that this is a component of Islam so they can blame Jews for what happens to them much like al Husseini blamed Jews for the holocaust (cited below). They organise protests and rallies to silence any critic of Islam, who might make available Islamic doctrinal references. As this group allows for only Jewish doctrine to be scrutinised, and allows for the cause of conflict to be attributable only to Jews, their stance is consistent with that of Hitler, and like Hitler, they're racists. Students for Palestine would, LIKELY, not be as successful in maligning critics of Islam if they were not supported by academics who also criticise critics of Islam. Tim Soutphommasane, an academic and column writer for Melbourne's tabloid newspaper "the Age", wrote that criticism of Islam's religious doctrine is merely a veiled racism! Students for Palestine's spokesperson, Yasemine Shamsili, interviewed during an anti-Gert Wilders protest, is a student of political philosophy at Monash University, the very institution where Soutphommasane is an academic. The field of academic pursuit for both is political philosophy (though I do not know if they have any shared involvement) at Monash University. Having vilified and defamed, the critics of Islam, groups such Students for Palestine give themselves a carte blanche to vilify Jews with impunity and assert that Jewish religion forms the basis of Zionism and that Zionism and the Jews alone are the cause for conflict. Pointing to the doctrinal basis (Koran or hadith) for the actions pursued by various "Palestinian" organisations, such as Hamas who openly proclaim these doctrinal elements as basis for their actions, leads to an accusation of being “racist”. According to the Students for Palestine, their association came into existence as a consequence of the Gaza rocket attacks of 2008/2009 by Hamas (see below). Hamas commenced the rocket fire attack against Israeli civilians indiscriminately and solely on the grounds that their targets were Jews by race. 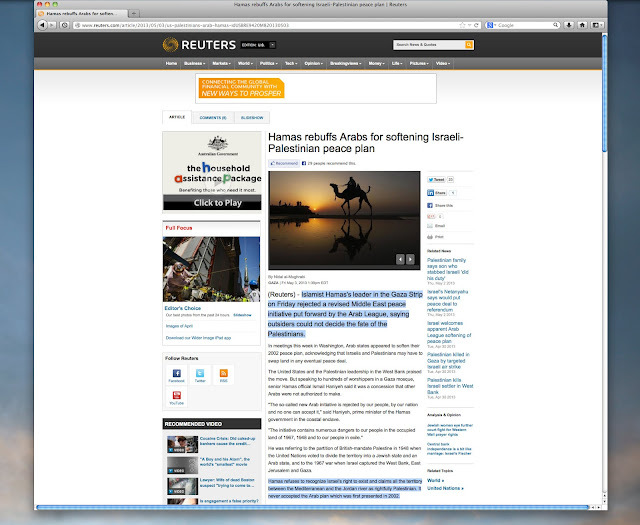 Human Rights Watch found in August 2009 that Hamas had perpetrated what amount to war crimes. 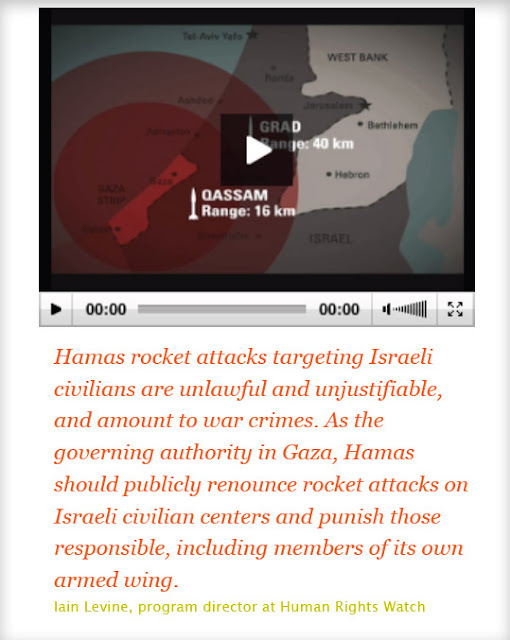 Human Rights Watch report: Hamas' rocket attacks amount to war crimes. Students of Palestine blame Jews for Hamas' actions. "Under the laws of war, individuals who willfully authorize or carry out deliberate or indiscriminate attacks against civilians are committing war crimes. The laws of war prohibit attacks the primary purpose of which is to spread terror among the civilian population." 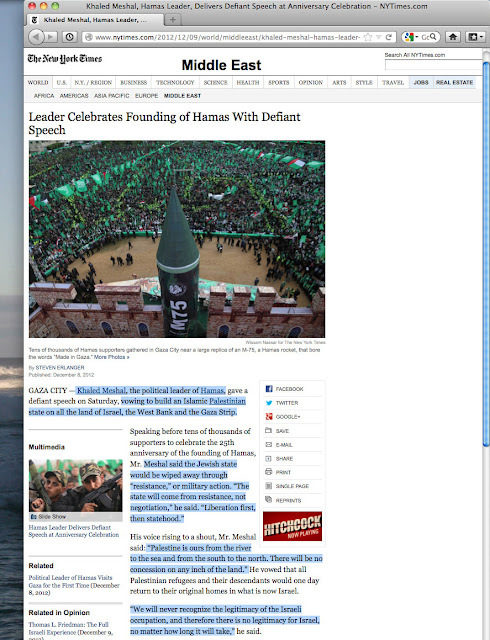 "Hamas forces violated the laws of war both by firing rockets deliberately or indiscriminately at Israeli cities and by launching them from populated areas and endangering Gazan civilians,"
"[A] fundamental principle of the laws of war is that they apply to all parties to a conflict regardless of the justifications for going to war. Whether it is Hamas’ claims of “the right to resist occupation” or Israel’s of the right “to combat terror,” the reasons for engaging in armed conflict do not permit a party to ignore its legal obligations in the way it conducts hostilities. "Some critics of Human Rights Watch's work have argued that its coverage of the Israeli-Palestinian conflict fails to recognize the great disparity in the magnitude and extent of the attacks and losses caused during the recent fighting between Hamas and Israel and the vastly differing sophistication of the weaponry used by each side, thereby creating an artificial balance and softening criticism of Israeli abuses. "The conflict in Gaza was indeed characterized by great disparity in the military strength of the parties to the conflict. Palestinian armed groups primarily fought with small arms, whereas the IDF used highly advanced weaponry, including armor and aircraft. "The purpose of the laws of war is not to create parity between parties to a conflict, or to assess their violations in light of their relevant capacities, but to minimize the harm to the civilian population. Violations of the laws of war are not measured in the number of civilian casualties, but whether each side is taking all feasible precautions to minimize civilian loss. Using unsophisticated weapons does not justify failure to respect the laws of war, nor does an adversary’s use of sophisticated weapons provide a pass to its opponents to ignore those laws. Disparities in military capability, however measured, are irrelevant." 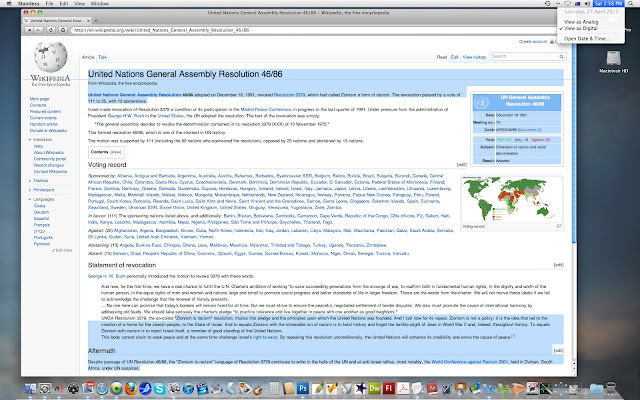 ( http://www.hrw.org/node/84867/section/2 ). Hamas, in pursuing their religion to make "Palestine" Judenfrei as it is ordered by the hadith, and who proclaim emphatically that the "Palestine issue" is a religious issue, and announce that the Koran is their constitution, have their intentions, and Islamic doctrine protected from criticism by calling "racist" those who might read the Hamas Covenant and investigate Islamic doctrine (Koran and hadith), because doing so will expose this to be a war waged solely by Islam against its doctrinal enemies, the Jews. Israel will exist and will continue to exist until Islam will obliterate it, just as it obliterated others before it"
The Islamic Resistance Movement: The Movement's programme is Islam. The Islamic Resistance Movement is one of the... complete embrace of all Islamic concepts of all aspects of life, culture, creed, politics, economics, education, society, justice and judgement, the spreading of Islam, education, art, information, science of the occult and conversion to Islam. 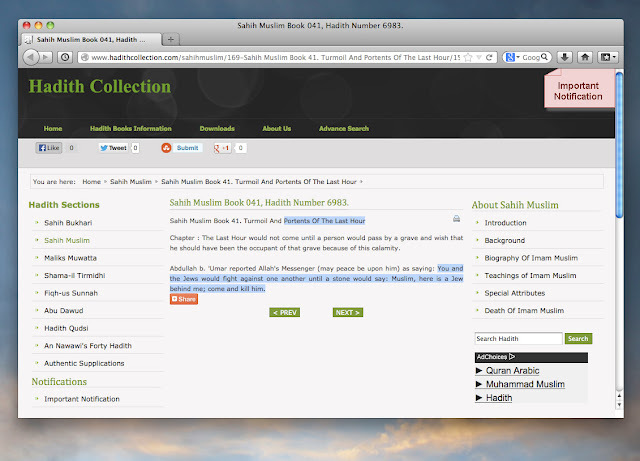 … adopting Islam as its way of life,… Allah is its target, the Prophet is its example and the Koran is its constitution. It is necessary to instill in the minds of the Moslem generations that the Palestinian problem is a religious problem. It is necessary to follow Islamic orientation in educating the Islamic generations in our region by teaching the religious duties, comprehensive study of the Koran"
Purely by arguments of omission, achieved by accusing their opponents of "racism", the Students for Palestine have mastered the art of propaganda. They have successfully re-engineered the "rational antisemitism" of early 20th century Germany. intends for the suppression of information regarding Islamic doctrine so that only the Jews can ever be blamed so that such people can claim to have a good reason for hating Jews, without having to defend why they are racists for singling out the Jews alone. Hamas is still trying to achieve what was proclaimed on Arab-language Nazi radio broadcasts 70 years ago. Students for Palestine call "racist" those who expose this so that they, because they are racists, can express their racist hatred of Jews unencumbered by having to defend themselves for their racism. This is the cause supported by Students for Palestine and anyone who supports the "Palestinian's" cause - regardless of whether they are aware of it. Any claim of a lack of awareness of what aims the "Palestinians" are actually striving for, by those who support the "Palestinian's" cause, is the personal problem of the claimant. According to introduction of the PLO Charter of 1964, the Palestinians are confronted by "the forces of evil, injustice and aggression, against whom the forces of international Zionism and colonialism ", Israel. Yet these very same claims are being repeated today. "anti-Semitism [as] international law". Australian Students for Palestine support the concept of legally enforceable antisemitism. 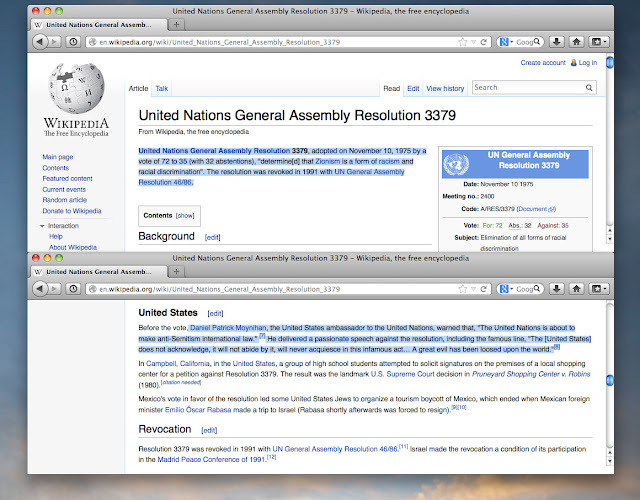 This UN resolution made it mandatory to hate Jews and was eventually revoked. The revoking of the "Zionism-is-racism" resolution by the UN. "United Nations General Assembly Resolution 3379, adopted on November 10, 1975 by a vote of 72 to 35 (with 32 abstentions), "determine[d] that Zionism is a form of racism and racial discrimination". The resolution was revoked in 1991 with UN General Assembly Resolution 46/86. 'another manifestation of the bitter anti-Semitic, anti-Jewish hatred which animates Arab society. Who would have believed that in this year, 1975, the malicious falsehoods of the 'Elders of Zion' would be distributed officially by Arab governments? Who would have believed that we would today contemplate an Arab society which teaches the vilest anti-Jewish hate in the kindergartens?... We are being attacked by a society which is motivated by the most extreme form of racism known in the world today'"
I'll reiterate, the resolution that associated Zionism with racism was another MANIFESTATION of the hatred of Jews, such as the Protocols. Turkey's Erdogan used the "Zionism-is-racism" criticism of Israel. He was internationally rebuked for doing so. Australia's student university organisations such as Students for Palestine still make the same call as Erdogan but suffer no rebuke. At the time of my writing this, a court decision in Australia's racial fatherland, the UK, found that hatred of Jews on the grounds of "Zionism" is not a hating of Jews at all, therefore, ruling in contravention to what the UK government agreed was a racist idea in 1991. A NAZI CAUSE - PRO PALESTINIAN cause is based on Nazi program. The charters of various "Palestinian" bodies is formulated on the charter articulated by Hitler for the Nazis. The Pro-Palestinian cause is based on the “Programme of the National Socialists” set out for Germany by Adolf Hitler in the 1920s and 1930s. The Palestinian cause, which is to cleanse Palestine of Jews, to make Palestine Judenrein, was one pursued by Nazis in Europe. Arab Muslim Nazi “Palestinian” al Husseini wanted to "solve the Jewish problem". No state of Israel yet existed. In the 1920s Hitler articulated the Nazi program; he rejected Versailles, declaring "self-determination" "for Germans" which was used to allow for a definition of Germany by race (German) and religion (Christian), and proclaim that this nation would be guided by Christian principles. This excluded Jews. The PLO and subsequent Palestinian groups used the Nazi template to reject the UN resolution for the creation of Israel (and Balfour), declaring "self-determination" to allow them, on the premise of "self-determination", to declare themselves to be Arab by race and Muslim by religion and that this nation would be guided by the principles of Islam, and this automatically would exclude Jews (as well as other groups) who are neither Muslim nor Arabs. (In Islam non-Muslim groups exist with severely restricted rights as dhimmi). Both the Germans and the Arabs declared that they were part of a greater whole; for the Germans it was that they were part of a greater pan-Germanic state; while for the "Palestinians" it is that they are part of a greater pan-Arabia. The PLO Charter, for instance, is not concerned with "Palestinians" as a people who are distinct from those who surround them with a distinct and separate history, but is concerned that the "Palestinians", who are a part of a greater pan-Arab-Muslim whole, are diminished because of a foreign, non-Arab, non-Muslim element (Israel) existing within what should be a homogenous Muslim greater Arabia. 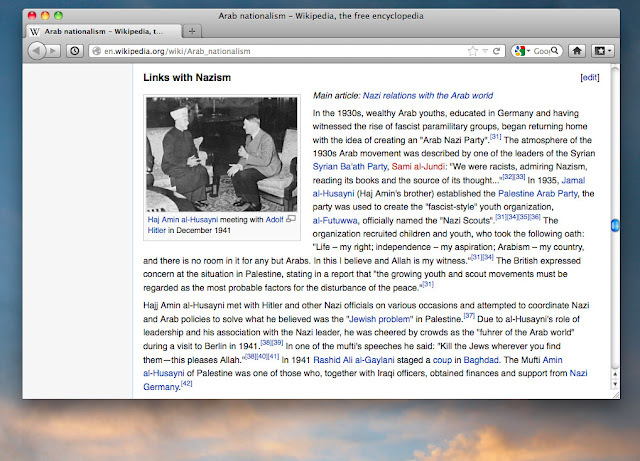 Above, screenshot of the Wikipedia page, "LINKS WITH NAZISM": “al-Husayni [al Husseini] met Hitler and other Nazi officials... to coordinate Nazi and Arab policies to solve.... the ‘Jewish Problem’”. Islam and Nazism had a shared objective. That objective is still pursued today, and it is pursued by the political left. Adolf Hitler was a Christian. Adolf Hitler made no secret of his Christianity. And, on account of his religious conviction, Adolf Hitler sought the genocide of Jews. Hitler’s desire was matched by an equally fervent desire in Islam to commit genocide of the Jews. Islam’s goal of committing the genocide of Jews predated Hitler by around 1100 years. In Islam the genocide of Jews is a mandatory prerequisite which, on it being accomplished, Muslims believe will result in the raising of the dead by god, Judgement Day. Both before and during WW2 German Christian Nazis and their Arab Muslim cohorts worked together to achieve a shared objective. Only two years after the Nazis became the government in Germany the “Palestinians” established their version of the Hitler youth, the “al-Futuwwa, officially named the ‘Nazi Scouts’” (Wikipedia, refer screenshot above). During the war, the Mufti of Palestine, al Husseini, lived in Berlin and worked for the Nazi effort. Al Husseini was a Nazi and was paid by the Nazis to make broadcasts on Arab-Language Nazi radio. Al Husseini broadcast in Arabic on behalf of "Palestinians" against the Jews, when no state of Israel existed. The Nazis-provided Husseini the resources to broadcast his messages against Jews. Among the broadcasts by al Husseini is one in which he paraphrased Hitler's Mein Kampf in 1943. Herf’s Nazi Propaganda for the Arab World, above, is a solid summary of the Arab-language Nazi broadcasts, including broadcasts by al Husseini. This objective is still sought for today. It predates the existence of Israel, though commentators prefer to believe that it arose as a consequence of the creation of Israel. The objective of al Husseini, like Hitler was to make “Palestine” Judenrein. 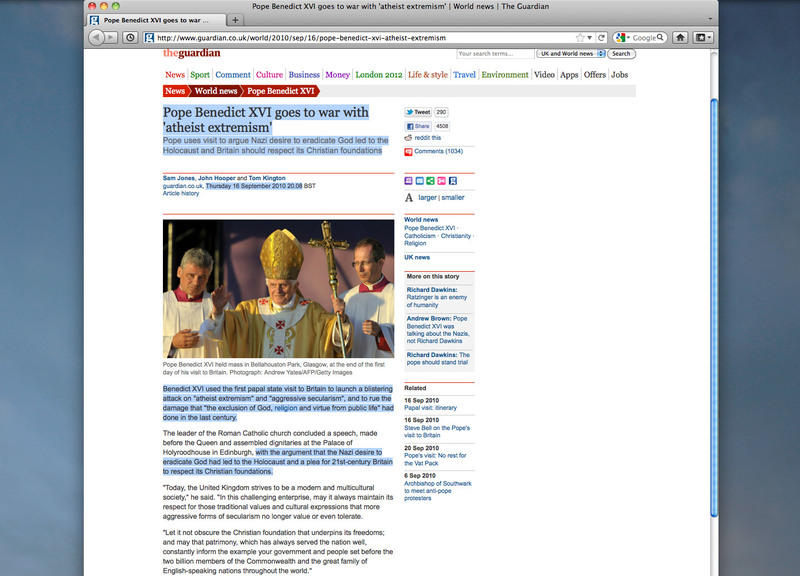 Against the charge of "atheist extremism"
However, before moving on, the issue of “atheism” has to be addressed. A persistent claim that is still being made today is that Adolf Hitler was anti Christian, an atheist. 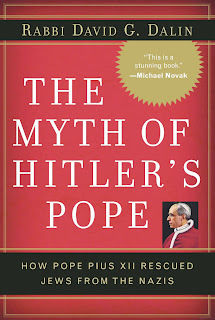 Australian Catholic, historian Geoffrey Blainey is cited on the Wikipedia as “proof” that Hitler was an atheist (below), a claim supported, not by evidence, but on the authority of Blainey as an historian, even though Blainey's claim is contradicted by the evidence. 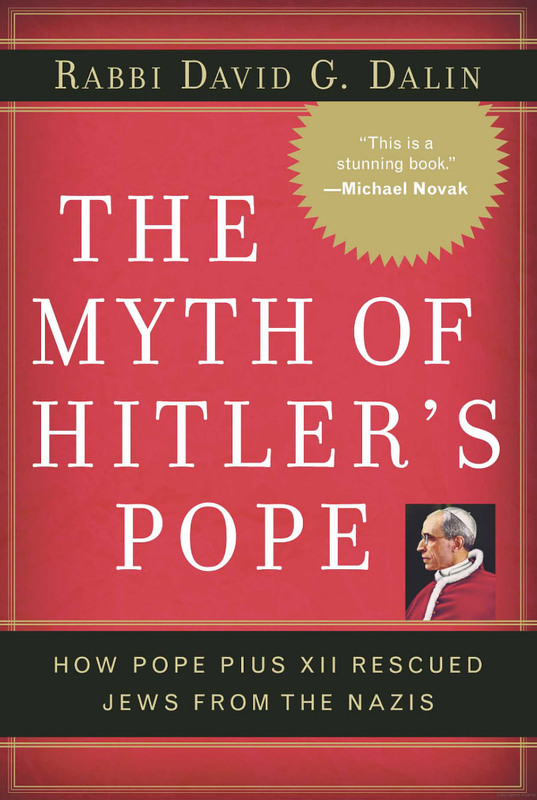 And in 2010, the German priest Ratzinger, who was at the time Catholic Pope, claimed that Nazism was an extremism that sought to eradicate god, below. Calling Hitler an "atheist" intends to remove from the crimes Hitler committed the Christian basis for his committing them. Similarly, Islam, which is the basis of a religious hatred of all Jews, which is the basis of a unilaterally declared war by Islam against Israel has to be removed from the context of any debate regarding “Palestine”, in order to blame Israel. By such means acts of terrorism consistent with Muslim doctrine are claimed to not be part of the fabric of Islam. An atheist familiar with Islamic doctrine is labelled “racist” if they have the capacity to reference the doctrinal basis of Islamic acts of piety - terrorism. This means that only Israel can be blamed. Both Adolf Hitler and pious Muslims (mistermed as “Islamists”) can, by having their religious motivations removed, be claimed to be acting for reasons that have nothing to do with their religion’s doctrinal hatred. Every atheist is by this means vilified. Religions are good, and atheists are evil. Are we supposed to accept this? Hitler’s desires were always Christian (as I have briefly discussed here http://www.vakras.com/christian-hitler.html ). And Hitler never made a secret of his Christianity. Al Husseini too was equally Islamic, and the desires he expressed are couched in Islamic doctrine. Hitler appealed to Christians using familiar Christian doctrine to describe and justify what he sought; and this was mirrored by al Husseini who made appeals in Arabic to urge for the extermination of Jews by referring to familiar Islamic doctrine. Both Nazism and Islam are religious-inspired movements. I have come across claims that suggest that the views of al Husseini were either his own personal views which had nothing to do with Islam, or that they disappeared with him. This is intended to create the impression that conflict in the Levant (“Middle East”) is a phenomenon that arose after WW2, not before it, which means that a cause after WW2 is sought to explain the hatred. This cause is then claimed to be the Jewish state (Israel). And that on that basis it is made to mean that there is no direct link of today’s terrorism to al Husseini or Islamic doctrine that dates to c. 850 AD (hadith). And it is then suggested that an absence of evidence showing a chain of dissemination from al Husseini to the PLO, to Hamas means no transmission has occurred, and that the current hatred is "new" and not a hatred related to the events that precede the creation of Israel. The first statement of independence made by the "Palestinians" after the creation of the state of Israel took the form of the PLO Charter in 1964; this was followed by a 2nd charter in 1968; and in 1988 Hamas released their Covenant. The Palestinian cause is a PASTICHE of the Programme of the National Socialist Party as articulated by Hitler in his speeches. The template of the Palestinian case is the NAZI program forged in Germany in the 1920s. viii) show that historically the state and the people you act for occupied a much larger territorial area, and that you have an historical right to this territory, which an external power has denied to you. viii) claim that there is no historical evidence of a “Jewish” state ever existing, and claim that historically this area has always been part of the “Arab Homeland”. “Israel will exist and will continue to exist until Islam will obliterate it, just as it obliterated others before it”, Preamble of Hamas Covenant 1988. The Palestinian President Mahmoud Abbas renews his pledge to the cause of "martyrs", which includes the Nazi al Husseini. The cause of the Palestinians, as was articulated by al Husseini, was for a Judenfrei "Palestine". ***It should be noted that unlike Germany whose Jewish population was relatively recent, the Jews in "Palestine" predate the Arabs by millennia. However the Arabs unilaterally give themselves alone the right to "self-determination". The Jews have no such right according to the Muslim Arab’s unilateral declaration. Non-Muslim Arabs and Jews of Palestine have no rights under this definition. "i. To create a single people... iii. To protect this people... and to restore to it freedom honour, and power." p. 120 Hitler Speeches, 6/6/1937. "The National Government will regard it as their first and foremost duty to revive in the nation the spirit of unity ... They regard Christianity as the foundation of our national morality... The are determined... to restore the nation to a consciousness of its political and national unity...”, PROGRAMME OF THE [NAZI] PARTY: p, 113, Baynes, Hitler Speeches, 1/2/1933. "... we must again profess the highest aim of all foreign policy, to wit: to bring the soil into harmony with the population." (that is people of German race have the right to be living on German-ruled German-Governed "soil") p. 593 Mein Kampf. "... the Reich's frontiers in 1914 were anything but logical. For in reality they were neither complete in the sense of embracing the people of the German nationality, nor sensible with regard to geo-military expediency... " (Mein Kampf, p.593). "... the new Reich must set itself on the march along the road of the Teutonic Knights of old, to obtain by the German sword sod for the German plough and daily bread for the nation." (Mein Kampf pp. 128-129). "The Palestinian people firmly believe in Arab unity, and in order to play its role in realizing this goal, it must, at this stage of its struggle, preserve its Palestinian personality and all its constituents (Article 11) Arab unity and the liberation of Palestine are two complementary goals; each prepares for the attainment of the other. Arab unity leads to the liberation of Palestine, and the liberation of Palestine leads to Arab unity. (Article 12) … the Arab Nation and even the essence of Arab existence are firmly tied to the destiny of the Palestine question. (Article 13)"
"1. Setting aside of the Peace Treaty. 2. Unification of all Germans. ... it was not our Movement [that] sign[ed] the Peace Treaty." 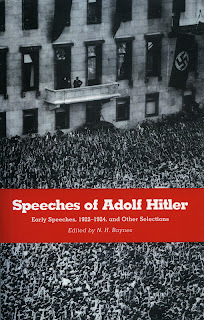 p. 57, Hitler Speeches17/4/1923, . "...declare to the foreign Powers: 'The Treaty of Versailles is founded on a monstrous lie. We refuse to carry out its terms any longer." 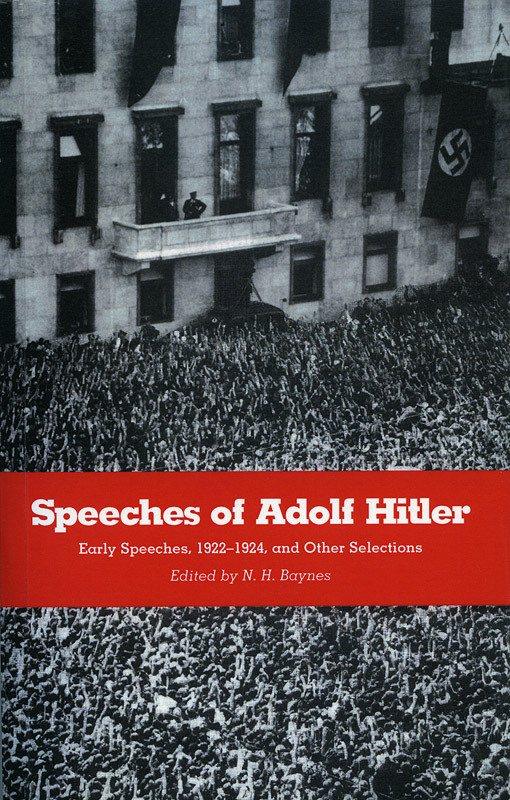 p. 75, Hitler Speeches, 1/8/1923. Hitler declared that Zionism exists for the purpose of creating a state in Palestine. Nazi Arab-language broadcasts during the war repeated this claim adding that WW2 was a Jewish war waged specifically to create a Jewish state. This was repeated by al Husseini in 1954. It is repeated in both PLO Charters and in the Hamas Covenant of 1988. The concept of “Zionism as colonialism” was taken up by the pseudo-philosopher and pseudo-historian who fudged history, motivated by his own personal bitterness, Edward Said. "…the Zionists try to make the rest of the world believe that the national consciousness of the Jew finds its satisfaction in the creation of a Palestinian state…[not] for the purpose of living there; all they want is a central organisation for their international world swindle endowed with its own sovereign rights and removed from the intervention of other states…" Mein Kampf, p. 294, Manheim transltion. “If the international Jewish financiers in and outside Europe should succeed in plunging the nations once more into a world war, then the result will not be the Bolshevization of the earth, and thus the victory of Jewry, but the annihilation of the Jewish race in Europe! ... If this nation [Jews] should once more succeed in inciting the millions which compose the nations into a conflict which is utterly senseless and only serves Jewish interests, then there will be revealed the effectiveness of an enlightenment which has completely routed the Jews of Germany in the space of a few years. The nations are no longer willing to die on the battlefield so that this unstable international race may profiteer from a war or satisfy its Old Testament vengeance." Baynes, Speeches, p. 197,12/9/1938. "Throughout the war, Nazi Arabic radio repeated the charge that World War II was a Jewish war whose purpose in the region was to establish a Jewish state in Palestine that would expand into and dominate the entire Arab and Muslim world... They claimed that an Allied victory would be a victory for the Jews, whereas an Axis victory would bring liberation from... 'Jewish' imperialism." 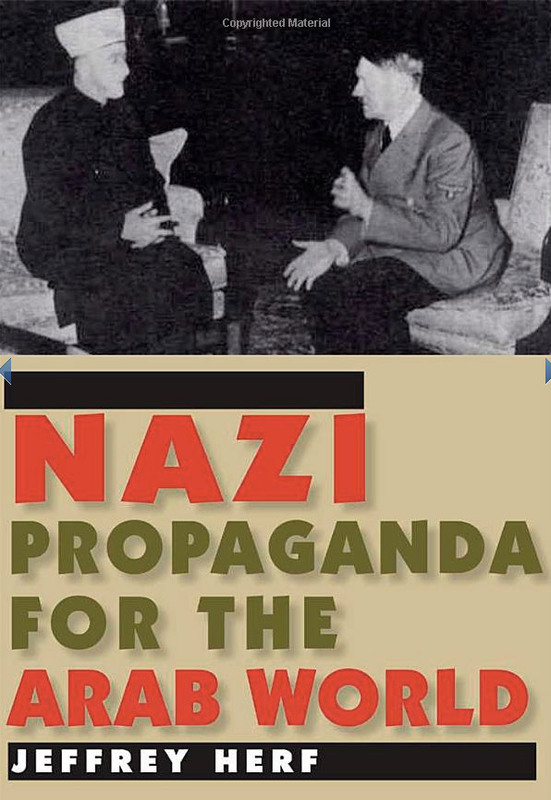 p. 13, Jeffrey Herf, Nazi Propaganda for the Arab World. "Partisanship for Arabs in Palestine… was present in these early broadcasts. It remained a central aspect of the Arabic-Language broadcasts throughout the war. In 'England's Betrayal of the Arabs in Palestine' of December 24, 1940, German radio declared that 'from pre-Islamic times' to the outbreak of World War I, Palestine was an 'undivided part of the Arab land. Its inhabitants consisted of pure race of Arabs [reinrassigen Araber].' After 'Islam defeated the Jews' they (the Jews) had no share in the country and finally had to leave it 'to stir up disorder and harm elsewhere in the world.' The broadcast attacked the Balfour Declaration and its support for establishment of a national home for the Jewish people of Palestine. It described the declaration as being the product of Jewish money and support during World War I." pp. 48-49, Herf. Edward Said took up the claims of al Husseini and Hitler and spun an entire body of writing around them which is swallowed uncritically if not worshipped by the contemporary left. The case against Edward Said is a forthcoming essay. The entire Palestinian Cause is written using the template created by Nazi Germany. It is a Nazi cause.